Back in July, a standalone version of Chrome finally became available for Daydream VR. You could visit sites or play web-based VR games without ever taking off your headset, and it was the first time standalone Daydream headsets (like the Lenovo Mirage Solo) could access websites. If you’re not a fan of Chrome, there’s another VR browser you can try – Firefox Reality. Firefox Reality offers mostly the same experience as Chrome VR. 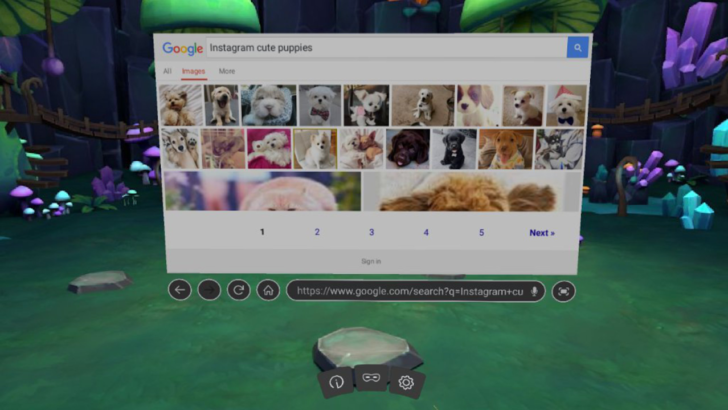 You have a single window that you can view 2D and VR content in, with an optional Private Browsing mode and voice search. Firefox Reality uses Mozilla’s Gecko rendering engine, instead of the Blink engine that Chrome VR and Samsung Internet for Gear VR use. I tried it on my 2016 Google Pixel, and it seems to work fairly well. Mozilla says future versions of the browser will have bookmarks, 360-degree video playback, Firefox Sync, and more. It’s completely open-source, so developers can contribute or create their own browsers based on it. The Daydream version can be downloaded from the Play Store, or from APKMirror. It’s also available on Oculus Go and headsets using the Vive Wave platform.